My interest in talking animals has recently jumped off the charts. Following a deeply satisfying read-aloud of Charlotte’s Web, I brought home Eric Carle’s “Slowly, Slowly, Slowly,” Said the Sloth. And there is one final passage that has a remarkable hold on me. The sloth thought and thought and thought for a long, long, long time. I dawdle and I dillydally. And I like to live in peace. “That’s just how I am. What would it take to know oneself so fully and clearly? What an absolute gift to know who, how and why you are without a hint of doubt. For all of my online chatter, including a steady stockpiling of text upon text of insights, outrage or just plain how-to instructions, the courage to proceed slowly, methodically and thoughtfully appears worthy of strengthening. My more recent immersion in social media has not come without a price tag. How I spend my attention, availability and even patience has changed and not necessarily for the better. 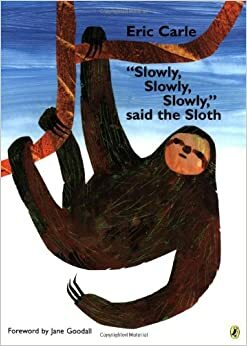 Thanks to Eric Carle, it may well be time for me to investigate and pursue the way of the sloth. To see just what can be learned in being more of who I am while doing considerably less. The capacity of the sloth to think without speaking, to reflect without simultaneously sharing, to take in the ideas of others without assuming them as his own offers a worthy example. The sloth reminds me that thinking and reflecting take time; that real understanding hardly comes in bursts – rather, it requires patience and some letting go. Those strike me as hard to come by and stick to these days. And there’s the lesson, waiting, like it always does, like a sloth might.